Angela Merkel has recently announced that divine providence will allow her to continue her work as chancellor, labor which has primarily focused on reshaping Europe for generations to come through the execution of a globalist plan which is now in jeopardy with the United Kingdom's exit from the European project and the rise of Donald Trump in the United States. Many of the people who voted for Brexit and Mr. Trump place responsibility on Ms. Merkel for allowing millions of unvetted refugees to flood Europe, risking the lives of thousands of Europeans in terror attacks that could spell the end of Western Civilization as we know it. Despite steering the European ship toward the iceberg, Ms. Merkel refuses to take responsibility for her failures in leadership and instead blames "fake news" writers for planting the ice mountain which has ripped open the Union, threatening to drown the progress made since the Second World War. 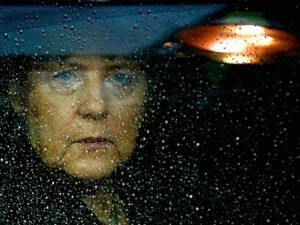 As the elections approach in several European Union countries, Ms. Merkel can read the storm coming, knowing fully well that the house of cards is about to be blown away to history. Instead of reversing ship on her failed policies, however, Ms. Merkel will instead target the satirists and independent news outlets who helped expose the absurdity of what she defines as social progress. Already in the Netherlands the police pay regular visits to people who take to Twitter to denounce the false song of globalism, and soon bloggers may start to get paid visits from the authorities under the guise of "riot prevention." The elite won't allow their pet project to die without a fight, and they definitely won't hesitate to label as an enemy of the state someone who challenges the official open border narrative. We may be in the early stages of the biggest crackdown on speech in the modern era.